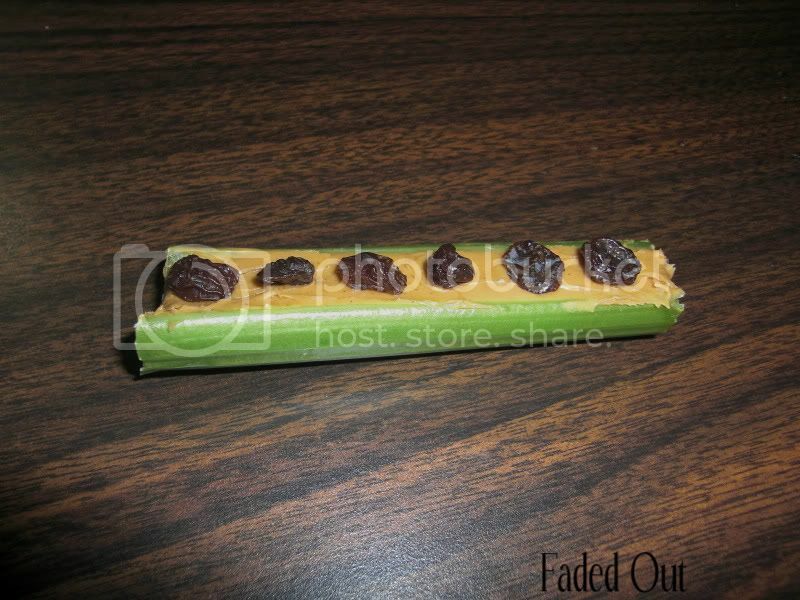 Recently while surfing the web, I learned that supposedly a popular snack for children (such as in kindergarten) is the “Ants on a Log,” which is basically just celery, peanut butter, and raisins. I never had this as a kid and coincidentally, my mom came home from the grocery store with celery. So, I made my first “Ants on a Log” snack. I’m not a huge fan of celery, but this was an interesting snack and the cute factor plus 2 out of 3 ingredients were things that I actually like eating, so I was willing to try out this snack. … And I approve! It’s pretty tasty. The celery makes it a bit healthy and gives it a crunch, while the peanut butter and raisins give it a sweet taste (say hello to my sweet tooth!). It is aesthetically pleasing/cute, so if you have a fussy child who won’t touch greens, maybe they will give this a try. I can also see this being a great appetizer at a party, too. So how do you make these, you ask? Simple. Too simple, in fact. But I guess I’ll include the “recipe” anyways. Wash celery. Cut up the stalks into smaller pieces (bite sized or long, however you like). Pack/spread peanut butter into the hollow center of the celery stalks. Place raisins or craisins on top of the peanut butter. You can change it up too, by having “Ants on Vacation” (without raisins) if you don’t like raisins, or “Ants on a Snowy Mountain” (made with cream cheese instead of peanut butter), or other fillings such as cheese, etc.